Staff removed carpeting and bookshelves, damaged by the leak, from the Cos Cob Media Center. No books and only one computer were damaged after a faucet in the second floor art room broke and leaked over the weekend early in October. GREENWICH — Reconstruction work Cos Cob School could begin as early as next Monday, now that a contractor has been chosen to make repairs after a flood closed part of the building last month, officials said Thursday. The Greenwich Public Schools administration is working with Wernert Construction Management and various town departments to expedite the contract and insurance approval processes so the work can begin as soon as possible, according to a statement released Thursday afternoon. Wernert has been working with the district and building administrators to select materials for the finishing and millwork components of the project, such as molding, trim, flooring and wall paneling. 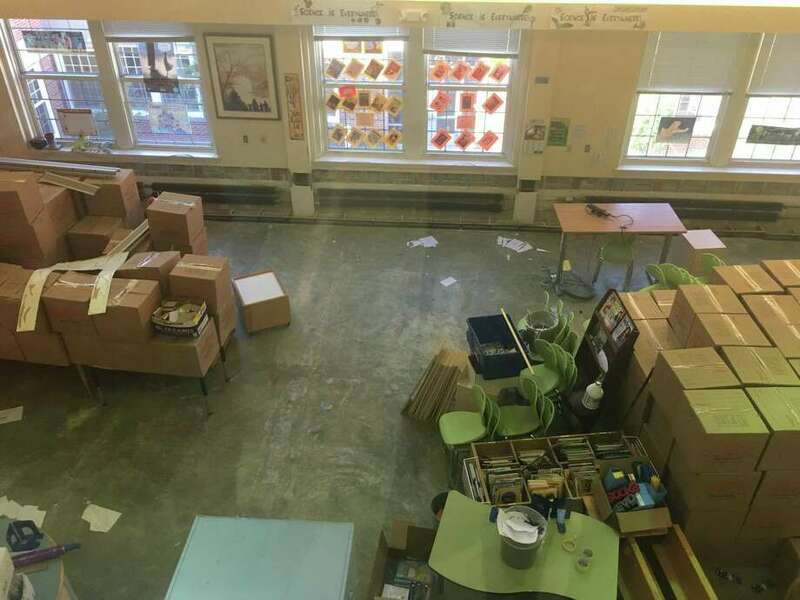 A water leak caused by a broken faucet in the second floor art room primarily caused damage on the first floor at Cos Cob School. That damage was found in the cabinetry, ceiling tiles and drywall, carpet and vinyl flooring, as well as walls, which had to be opened up to prevent mold from growing. As a precaution, school officials also decided to take out more sheet rock and ceiling tiles in classrooms to make sure all the damaged areas are removed. Cos Cob School was closed for a week after the leak. Since then, first- and second-graders have been using classrooms at Old Greenwich School and the kindergartners are at Parkway School. Students in grades 3, 4 and 5 are using classrooms on the third floor of Cos Cob. If the district can finalize the contract and Wernert can begin working by Monday, officials say they intend to have reconstruction, inspections and approvals completed in time for students to return to Cos Cob School after the December recess. Oct. 6: On or about this day, a faucet in the second floor art room at Cos Cob School breaks, causing a water leak. Oct. 7: Greenwich Police discover the leak when they responded to alerts from a motion detector, which picked up movement caused by ceiling tiles that loosened and fell due to the spreading water. Oct. 8 to Oct. 12: Greenwich Public Schools close Cos Cob while officials develop a relocation plan and begin cleaning up. The district conducts baseline air quality testing on Oct. 8. Oct. 15: Students return to school. Old Greenwich takes in first- and second-graders, and Parkway takes in the kindergartners. Students in grades 3, 4 and 5 return to Cos Cob and use classrooms on the third floor. Oct. 18 to Oct. 22: The Board of Education, Board of Estimate and Taxation, and the Representative Town Meeting vote to accept an interim appropriation request of $1.9 million to cover clean up, remediation and reconstruction, as well as to buy furniture, and pay for transportation and other relocation expenses. 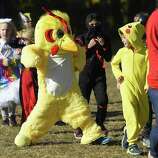 Oct. 31: The school district sends an update saying all the clean-up and remediation activities had been completed by Oct. 29, and that officials would choose a contractor by Nov. 2. Nov. 8: The school district issues another update announcing its contractor, Wernert Construction Management.